Lake Atitlan is perhaps the most attractive tourist spot in the central American country of Guatemala. A major attraction because of its beauty, ecology, recreational activities and western accommodating facilities; nothing symbolizes luxury more for the weary traveller than a hot shower and clean sheets! Each town bordering the lake seems to cater to a different type of traveller or travelling objective. If you’re the kind of person who likes to experience the complete feel of a place, you best plan to stop off at each of them. San Pedro is where the majority of tourists go and is a bit of a backpackers party town; San Marcos is the self-healing Mecca of the bunch with yoga and meditation retreats, reiki and the like to manifest a bit of peace within; and Xela (pronounce Sheelah) and San Juan are where the eco warriors descend with a number of community projects underway to help the local peoples and preserve the natural environment surrounding them. Alas, it is the town of Xela and San Juan that are currently getting the best run for their money and time, in terms of looking after the beautiful Lake Atitlan. In the last month or so the water body has been taken over by unhealthy algae, which is producing bacteria that are suffocating everything that lives in the lake. The algae carpet has been fed by toxic pollutants such as chemical phosphates (like those found in unnatural laundry detergent) and synthetic compounds (like those found in sunscreens) as well as petrol residue from the motorised boats ferrying the thousands of tourists that visit the lake each year. The pollution has accumulated more rapidly in the last three decades due to the influx of tourists visiting and swimming in the lake. You see, it wasn’t until the 1980’s that locals started selling the land surrounding the lake to foreign visitors who swept in and built the infrastructure to attract travellers, like big hotels, restaurants, internet cafés etc, that are there today. If they could have predicted the impact this would have on their homes, perhaps the lake would not be in such trouble today? In the towns around the lake there is now a great divide between the indigenous Kechiquel people, who dwell higher up the hill, and those that live in the settlement and live clese to the lake shores within the ´tourist´ areas. The situation has become such that a Latvian woman I spoke to told me that the local indigenous people are embarrassed to spend time lower down in the township. A teacher at a local primary school, Yellanor had helped to organise a concert with the school to raise funds for the local community but the those that came down the hill stayed only a few minutes because they felt so uncomfortable: the divide between rich and poor was just to obvious. It´s not just the beauty of Lake Atitlan the Kechiquel are worried about being destroyed, it´s also their livelihoods. 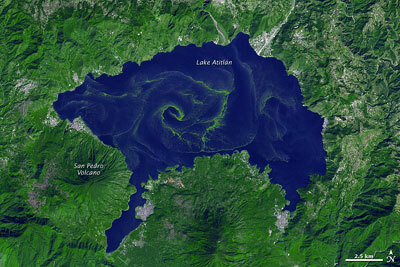 Each part of the lakes ecosystem is affected. The people and the local wildlife have nothing to fish if all the underwater life is dying. They rely on this to not only feed themselves but to sell to the restaurants and surrounding towns demanding fresh fish. The lake is also currently un-swimmable which means that tourists may stop coming to the area and hiring boats for transportation to other towns around the lake and partaking in recreational activities based on the water – another means of income lost. The situation has become so bad that in 2009, Lake Atitlan was named Threatened Lake of the Year by the Global Nature Fund. So, for the second time in the last 500 years the Kechiquel people of Guatemala are faced with a major threat to their culture as well as a devastating environmental collapse. It was not so long ago; in the 1500´s that the Conquistador (Spanish Conquerors) invaded the Mayan land with Catholicism here. As a consequence most of the indigenous people here are Evangelists and have lost much of their Mayan beliefs and traditions in the black whole of forgotten time. The Mayans have no written language so this loss is even greater despite some of the revealing archaeological finds on the continent. As all is passed down orally, all most of these people know of their history is of the time since the church arrived. However, from another source I´ve heard that the ancient Mayan ways are still practiced with ceremonies and rituals carried out regularly and in private, albeit amongst a minority. Now these ancient peoples face evolution of the ecological kind – a dark shade of eco green at that. The good new (finally!) is that there is help at hand. A group of expats are working at saving this beauty. A few individuals have come up with the beginning of a solution and have started to build a wetland to stop the eutrophication of the lake. So far, this has involved a huge earthmover, a whole lot of Quetzals and the support of the community – from the rich foreign land owners to the poorest of the poor, the local areneros. Though the lake is no longer being polluted by waste pipes upstream there is still a long way to go. The project involves cleaning about 70 litres of water a minute by way of nutrient retention, evaporation and absorption. A proper drainage system needs to be installed and that’s going to take a lot of resources to get Lake Atitlan clean again,. As for the local indigenous people, beyond helping to clean up someone else’s mess they could do with getting some help to buy back the fertile land of the lake shore.